For professional dancers working as part of a company, the exchange of those dancers – rather like an international exchange often facilitated by secondary schools – can bring huge benefits to individual artists, companies and audiences. This could be hosting international guest dancers or sending dancers to perform with companies overseas, and whilst it can involve lots of readjusting it is something well worth considering. 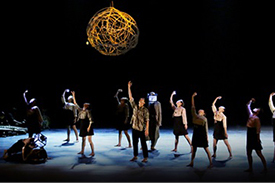 When dance companies tour they are able to bring their craft to different audiences and different parts of the world. It is costly for the company, but the results are two-fold. Not only is the company’s work seen by new people and enjoyed by a more varied audience, it also means the dancers are able to mature as artists as they adapt to different demands imposed by touring. The same can be said for performing with a different dance company – this could be in another town or city, or it could be in another country altogether. Hosting guest artists and sending dancers to other countries to be guest artists is a tradition of the performing arts sector around the world. This opportunity for cultural exchange also provides inspiration for the dancers: it is not just about performance but also about working in the studio: the approach, the attention to detail, how they interpret roles or pieces, music, and how they relate to other dancers on stage. It is arguable that really special artists come about because of both natural talent and so many experiences of the world, having learnt from many different people along the way. That is possibly the greatest thing about an exchange of dancers – learning from each other. There is always something to be learnt from every experience , not only from fellow dancers but the whole experience of working within a different cultural environment, with different teachers, levels of discipline, the atmosphere, and the company’s culture.